The colony ships took sixteen years to travel the twelve light years between Earth and Tau Ceti. 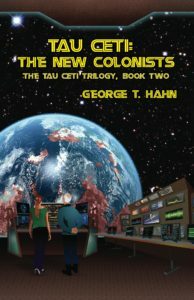 Tau Ceti 2, known as Pitcairn, was easily the most successful of the original three colonies, a stable peaceful world for two hundred years, yet isolated more than any other group in history. Supply ships came every twenty years or so, bringing cargo not available on the planet and new colonists, but not disturbing the tranquil colony. But change, for better or worse, was coming. It began with the arrival of the library ship Asimov in the year 2322. The arrival of the library ship Asimov had brought Pitcairn out of the lethargy of two hundred years of isolation. 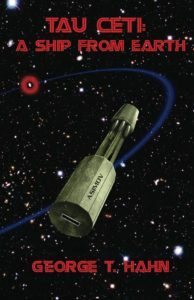 The Pitcairners used the knowledge from Asimov to build a better world, less dependent on faraway Earth. The announcement of a new ship, Endeavor, which could make the journey in weeks instead of years, promised a closer relationship to Earth. That should have been a reason to celebrate, but the colonists had a secret, and its revelation could endanger everything they had accomplished. Endeavor would bring a new breed of colonists with challenges unlike anything they had faced before. Pitcairn supplies Earth with critical medicine, supports scientists from Earth, and operates a library ship that gathers petabytes of valuable data. Somehow, it isn’t enough. For mysterious reasons, the Western Alliance tried to undermine the colony’s control over itself in pursuit of mysterious goals. Now, the Western Alliance has called a conference to discuss colonial policy, and the uninvited colonists are convinced that the conference is a ploy to justify the use of force against them. Patrick Malley, Administrator of the colony, is determined to attend the conference and fight for his world.Battling intrigue and unfamiliar technology, the colonists will face the power of the Western Alliance, leading to a deadly confrontation in deep space. The battle of Trist was over, and the colonists that had taken over the library ship Capek had won. The forces of Earth would come for them soon, though. There was a world in a distant star system, orbiting in a favorable orbit and possessing a breathable atmosphere. 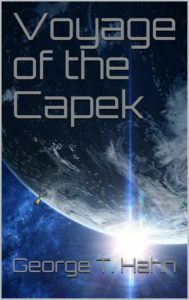 Knowing no more than that, the colonists and Terran survivors of the battle took Capek on a voyage that would take years, threatened constantly by the divisions within Capek's passengers. A planet waited for them, but what kind of planet? 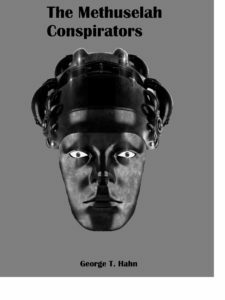 This novella is a sequel to the Tau Ceti trilogy, and especially the third volume of the trilogy, "Tau Ceti: The Immortality Conspiracy." 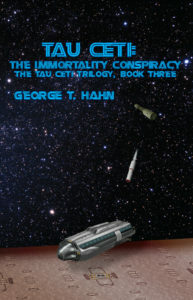 The Tau Ceti trilogy told of the Tau Ceti colony’s struggle against Western Alliance forces attempting to exploit the colony’s library ship for a mysterious project. But who were the people behind the project? 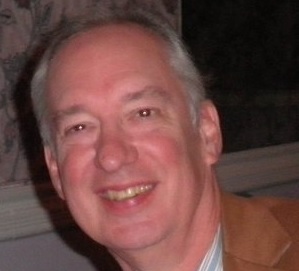 The Western Alliance President who wants to keep his power by uploading himself to a computer. The general who ostensibly serves the president but has his own obsession for power. The paralyzed scientist and his team, dragooned into working on a project that may destroy their society. The sentient computer that will become a target for the project. The Methuselah Project will determine their futures and the future of the Western Alliance. The original Tau Ceti trilogy was inspired by a visit my family took to Old Sacramento, many years ago. We visited the Wells Fargo Museum, and I was attracted to an exhibit about the Wells Fargo wagon, immortalized in song in "The Music Man." The exhibit explained that the visits of the Wells Fargo wagon were the only contact with civilization for people far out on the prairie, and how important those visits were to the people living there. It occurred to me that, if we ever colonized another star, the colonists would be far more isolated than those people in the frontiers of America. After all, Einstein showed that we cannot travel faster than the speed of light, and it takes light four years to get to the nearest star other than the Sun. My novels take place on the planet Pitcairn of the star Tau Ceti, twelve light years away. Ships arrive from Earth only every twenty years or so, bringing news, supplies, and new colonists. More novels expanded on the universe that began with the trilogy. The novels deal with starships, advanced computers, alien life, and so on, but all that is only the context of the trilogy. It's really about people, how they have adapted to their new home, and how their lives are affected by the arrival of another ship from Earth and changes in their relationship with Earth. The stories of the Library Ships Saga are available on Amazon in paperback and Kindle.